Combine your audiences into a master audience that uses groups to simplify your contact management. Groups help you target campaigns to specific contacts, and reduce the need for duplicate contacts across audiences. In this article, you'll learn how to combine your audience to a master audience that uses groups. This process is optional but can help streamline your audience management by keeping all your contacts in one place. It also can potentially reduce your monthly bill if you currently have duplicate contacts across audiences. Mailchimp requires that audiences must be retained for seven days after an email campaign or automation email is sent. If you've recently sent to one of your audiences, you won't be able to combine it until after the seven day period. Be sure to update any signup form URLs, and pop-up, embedded, or hosted forms to reflect your master audience. This process involves four important tasks. Back up your existing audiences. Create groups in your master audience. All audience actions are permanent and can't be undone, so we strongly recommend youback up each audience, including your master audience, before you combine them. Keeping a backup is a safeguard, as some data may be lost when you combine audiences. To export all audience contacts, follow these steps. Click the Current audience drop-down and choose the one you want back up. Click the Export List button to prepare a CSV file of your contacts. After the audience has finished exporting, click Export as CSV. We'll automatically separate your contacts into separate files for subscribed, cleaned, nonsubscribed, and unsubscribed addresses. Repeat the above steps for each of the audiences you're working with. If you're using an existing audience as your master audience, be sure to also export that audience for backup. Organize your master audience with groups that identify the audiences you’ll combine into your master audience. Groups provide contact management within one audience. To add groups to your master audience, follow these steps. Click the Current audience drop-down and choose the audience you want to use as your master audience. Select the As checkboxes option. In the Group category field, type a title or category for your groups. Input a Group name that corresponds to each of your original audiences. Click Add Group if you need more group names and click Save when you're done. 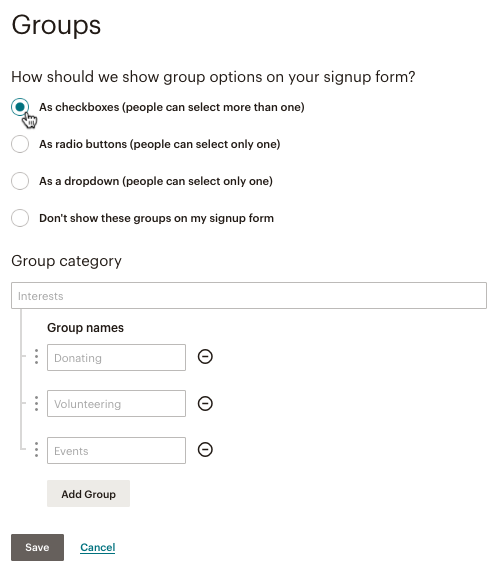 Groups are visible on the hosted signup form and update profile form by default. Hide your groups if you don’t want your contacts seeing them on forms. There are two ways to combine your existing audiences. You can use the Combine tool or import your exported CSV files to a master audience. Each process has its own advantages and limitations, so make sure to choose the one that best suits your needs. These resources provide step-by-step instructions for each option. After you back up and combine your audiences, delete your old audiences from your account. This process also deletes all audience stats. If you want to combine your audiences but don't want to delete your audience stats, you could remove your contacts from your old audiences, but leave the audience intact. To delete an audience, follow these steps. In the Are you sure? pop-up modal, type DELETE to confirm, and click Delete.